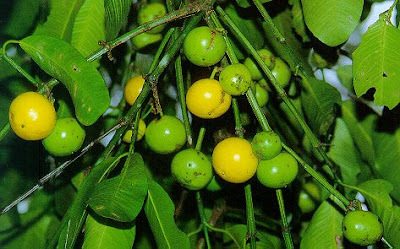 Fruit Warehouse | Mundu ( Garcinia dulcis ) | Mundu plants (Garcinia dulcis) in the form of short-trunked tree with a maximum height of 13-15 meters with a conical crown upward. Mundu rod-shaped twig almost covered many square is easily broken and fluffy. Mundu fruit is round with the top and bottom slightly tapered with a diameter between 5-8 cm. Young fruit is green when unripe and turn yellow bright (shiny) when ripe. 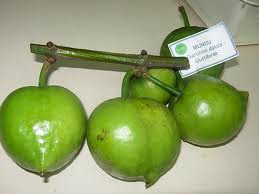 Mundu fruit (Garcinia dulcis) has a size of 2.5 cm 1-5 seeds brown. 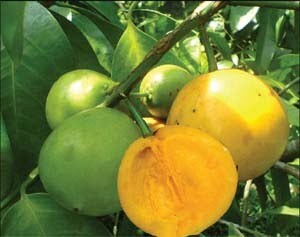 Mundu or flat (Garcinia dulcis) is a kind of fruit tree that is native Indonesia.Buah also called apple java. The fruit can be eaten fresh or made into jam. Mundu is a kind of fruit trees are increasingly rare members of the genus Garcinia is closely related to the mangosteen (Garcinia mangostana) and kandis acid (Garcinia parvifolia). 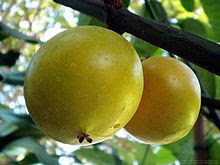 Mundu is believed to be native fruit crop grown in Indonesia is only part of Java and Borneo, although this plant is also grown in the Philippines and Thailand. Benefits. While wood and leather, formerly often used as a blend of natural green color maker. Taste sour mix sweet fruit with yellow skin bright fruit Mundu is in addition to the distinctive taste, it also contains fiber and high water. To consider when eating the fruit directly Mundu is a sap.